Boomtown has alway been about sharing our passion for music and art with as many people as we can persuade to listen! In fact for the last 5 years, through a series of outreach projects we’ve been on a mission to take that love for festivals, the carnival, community and creativity directly to people who haven’t had the chance to experience the magic and show them exactly what we’re talking about. To inspire people early the Boomtown Carnival Outreach Projects which have grown in size year-on-year, are specifically created for children and young people (5-18 and their families!). Led by experts from the carnival and music world, they’re made up of a series of interactive workshops that include dance, acrobatics, circus, music making, carnival crafts and costume design and radio interviews and production or film documentary skills. All of which are designed to inspire, teach new techniques, offer new experiences and ultimately foster a love for music and art. To support our local communities the workshops take place in Winchester (where the festival is) and Bristol (where our head office is) in June-July. Everyone is welcome and there is no experience required! If they spark a creative fire and they would like to, any families who attend the workshops are invited to showcase their new designs, artwork or dance skills at Boomtown itself, as part of the the Sunday Carnival Parade. To find out more about the rest of our involvement with the local community, check out our local pages here. 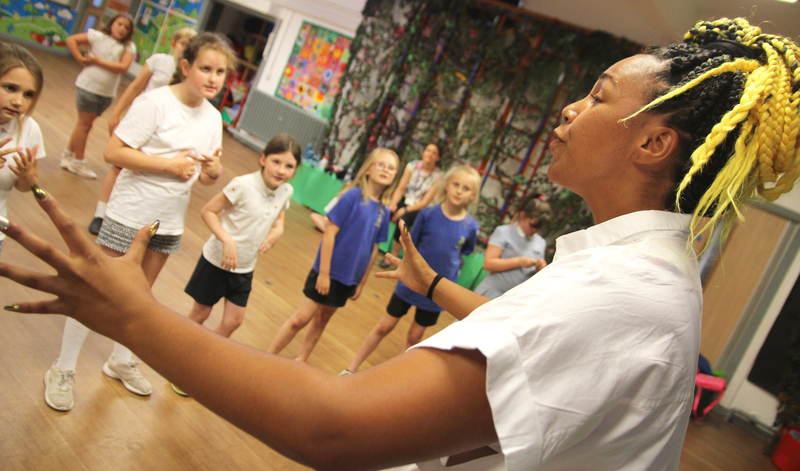 To celebrate Boomtown’s tenth anniversary the Outreach Projects went on a road trip to Bristol and Winchester with a programme packed full of Carnival Costume, Theatre and Dance, Music, and Radio production workshops. Led by singer/MC Eva Lazarus, Keshav Singh from Jus Now, dancer Theo Oloyade and the team from Radio Plattform, there was no end to the experts on hand to to teach the vital skills needed to bring the carnival to life. Everyone who attended was given the chance to help us mark the festival’s milestone by performing in the Opening Ceremony on the Lion’s Den Stage in front of 30,000 people and taking part in the Sunday Carnival Parade. A chance of a lifetime! In partnership with Bassline Circus, with thanks to funding from Bristol City Council, together with all the young people, we created one of the most epic opening shows ever. Our thanks go to all the families that took part and our venue partners; St Paul’s Adventure Playground, Bristol, Winchester Discovery Centre and Winnall Primary School in Winchester. Facilitators: Circus Zambia, Abi Kennedy and Tomasin Cuthbert Menes - costume, Radio Platfform, Theo Godson Company, Olivia Francis and Manuela Benini - dance. With massive thanks to Mia Harris, Natalia Colville, Claire Horton, Luke Plaister, Mimi Clifford, Lizzie Hall, David Peverley, Andrea Greenwood and the carnival team for making it happen and Gary Thomas film and edit and footage from Clockwise and Hannah Tyson for this video. What was said about us!